We are a leading Manufacturer of press section, m.g. 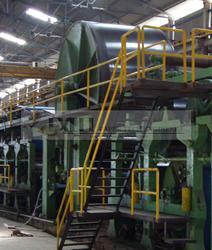 section, calendar section and paper mill dryer section from Ahmedabad, India. The main function of the Press Section is to continue to remove water from the pulp fibers and to smooth the surface characteristics of the felt and wire sides ( top and bottom sides ) of the paper web running the length of the machine. Single Nip Press Section with Pneumatically or Hydraulically loading system. First Class lever and Fulcrum Stand Type Heavu Duty Framing for Maximum Dewatering of the Running Paper, Nip Loading through Pneumatically or Hydraulically Cylinder. H Type Framing comes with Top and Bottom Press Roll changing easy arrangement. 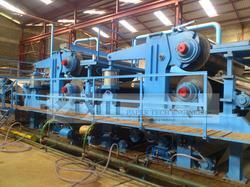 Vibration free sturdy Framing design which ensure the Press roll free running even in the load. Press, suitable for Kraft Paper, Writing & Printing Paper, News Print Paper. Width available up to 4.5 mtr. M.G. Section is provided with the Mild Steel Heavy duty framing. A frame offers the maximum coverage of paper MG surface ground finish and is statically balanced. M.S. Fabricated M.G. Cylinder made out from IS 2062, Ultrasonically Tested Plate. Size available up to 16 Ft Diameter & 4.5 mtr, Width. Suitable for 175 PSI Steam Pressure. Belt Grinded, Mirror Finished Top Surface for getting maximum Glaze on the Paper. M.G. Cylinder provided with Scooping system for removal of condensate water. 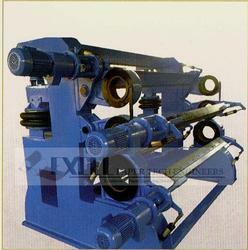 Stress Relived fabricated gear and pinion provide maximum 600 MPM rotating speed of the M.G. 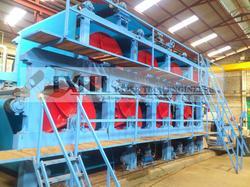 Optional S.S. coating paper contacting surface. Optional Hood for improve production & save condensation of vapor, Hood will be made out from M.S. or S.S. as per requirement. We are one of the pioneer names in the industry engaged in providing a high quality range of Calendar Section to its customers. Known for its excellent quality, our range of Calendar Section is available to our customers in varied volumes and sizes depending on their specific requirement. Made by our team of experts using high quality material, it is available to our customers at nominal prices in the market. our clients can avail an array of Dryer Section which are provided with heavy duty graded cast iron and mild steel frame which offers maximum coverage of paper under the dryer. The dryers come with a surface ground finish and are dynamically balanced. Framing made out from High Grade Cast Iron, The framing is specially designed and calculated for carrying load and suitable for absorbing a vibration stress. Framing comes with fine machined padding, where other accessories such like, Felt Roll, Paper roll, Doctor Holder are fixing. Pre assembled and match marked framing to ensure easy and proper assembly. Dryer Cylinder made out from IS 2062 M.S.Ultra Sonically Tested Plates. Crowned Dish with Shaft and supporting Ribs are providing more Strength. Deryer Section comes with all accessories such like, Ebonited Coated Felt Roll, Spur Gear, Pinion, Pneumatically loaded Doctor Blades, Central Lubracting System and also with Rope Carrier system. We Provide two types of Dryer Section -one is By Spur Gear & Helical Gear Box and another is by differential roll Slient Drive with help of Screen and individual gear boxes. Looking for Paper Machine Sections ?